Home Beauty Hair Is The Tangle Teeser Worth Buying? With the rapid increase of chemical hair products we are feeding our hair with these days, tangles are a universal hair problem. People who are born with naturally thick and heavy hair- like myself – have to spend a lot of time managing their hair. This was a reason I felt the Tangle Teezer could be a perfect tool! The Tangle Teezer is a cute, little powerful tool that perfectly fits into your palm, can be easily carried around in your purse and gives you detangled, shiny and fabulous hair anytime and anywhere. It comes with a click-on click-off lid that protects its special teeth from fluff, dirt and damage. I bought the brush for approximately 250 LE from Mohamed Al Sagheer Beauty Salon. I must confess that it took me time to actually appreciate this hair brush. I used it a few times and felt it was too small for my long hair. However, the Tangle Teezer does everything it claims. It perfectly cleanses out hair leaving it shiny, smooth and polished. 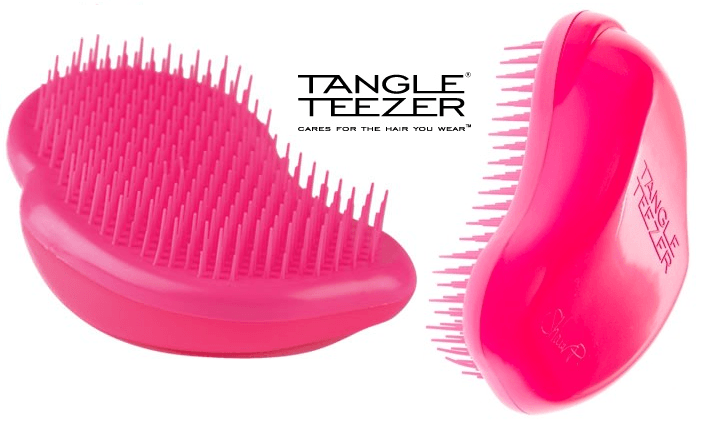 The soft teeth of Tangle Teezer gently massages the scalp and promotes blood circulation to the hair roots. Being lightweight, it is easy to carry and does not ache your arms while grooming long hair. Hygienic with a click-on lid that stays perfectly in place. The size and shape provide a perfect non-slip grip. Quick Tip: Never brush your whole hair in long strokes or try to de-tangle hair forcefully. Tangle Teezer’s soft and flexible teeth work best if you take one strand of hair at a time, brush it and then move on to another strand.